We have all been there. The shopping bags are now empty but you’re still missing that one key ingredient… Or rooting through the cupboards to locate that essential item you just knew you had at home.In the past your options were limited – a trip back to the supermarket was called for. Back to the trolleys, the beeping, the people… But now, you have Pinga. Using our service, you can get pretty much anything from our network of trusted Pinga partners. Your item will be delivered directly to your door within just 15 minutes, saving the day and your time.Best of all, the process is super simple. Just download our app and ask for literally anything! Missing parsley or a bottle of wine? No problem. Your request will be taken up by one of our partners, and you can communicate with them directly. 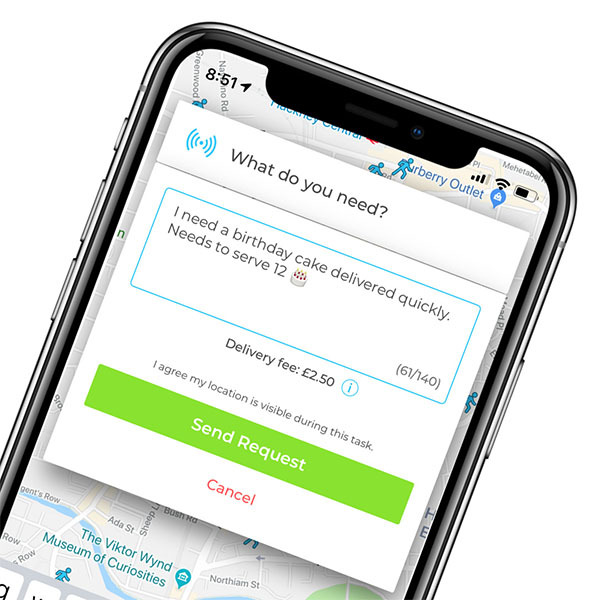 Payment through the app is very simple and secure, giving you peace of mind and the freedom to focus on whatever you are doing.Our users love the convenience and thanks to our trusted network of friendly Pinga Partner, every delivery goes off without a hitch. Our service is here to make your life simpler and more convenient: your product will be in your hands in a flash. Do you need something that isn’t stocked in a supermarket? No problem. We are happy to take care of courier and off-license requests, as well as other quick tasks that can help you save time. Our Pinga Partners are here to deliver whatever you need, when you need it. When using Pinga, you don’t have to worry about high minimum orders either. Just need that herb or spice to finish up your meal? No need to order a basket full of items. Our team of Pinga Partners will deliver any supermarket items to your door. Download the app, request your order and get it delivered in minutes. Needed a couple of birthday cakes from M&S for an office birthday. Need 5-6 items from Tesco for dinner tonight, can you help? I need some bits from Sainsburys for dinner but kids are asleep so I can’t leave the house.